It's always a clown show with these people. 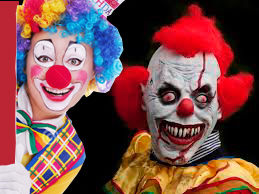 (And it's not even GOOD clowns -- It's always the bad scary kind.) They can't just go and ask questions and have a respectful conversation. I speak, of course, of liberals everywhere. Perhaps nowhere is this side show phenomenon more evident than on college campuses. 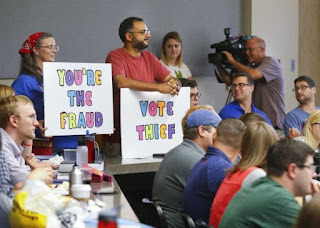 The clowns brought their side show to the University of Kansas Law School where Secretary of State Kris Kobach, a former law professor at the University of Missouri-Kansas City, and Mark Johnson, KU law professor, debated voter ID. I love the idea of this event -- two smart people present their evidence to an audience of bright, open-minded folks who are willing to listen to the debate. But that's not what happened. The liberal Kris Kobach detractors arrived with signs created by some third graders. The libs made desperate pleas for attention and as you can see from the photo below, the cameras tuned to their desperation. Notice the sane people attempting to watch the debate. This is par for the course. Wherever Dems are rallied to a cause, they turn it into a drum circle of weird and inappropriate. See Occupy Wall Street. 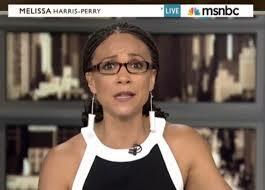 Or see Melissa Harris Perry, wearing tampons on her head. A liberal pundit. Wearing tampons. Because ovaries or something. 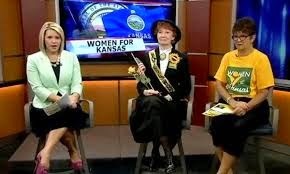 And then locally, we have these people, Women for Kansas. Can we please stop pretending these folks are to be taken seriously? Seriously. Tents, shades and gazebos' evoke dreams of various intending to various gatherings of individuals. In this current universe of today, they are an extraordinary innovation of comfort. Underneath the insurance of a gazebo, companions can assemble, families can unwind and business partners can meet. Numerous guardians joke that they must take out a second home loan to pay for school, however shouldn't something be said about for overnight camps? What are the expenses and is it worth the advantage? We send our children to school since we realize that this venture will help them secure better-paying employments and a brighter future. For an outdoors encounter, nonetheless, is it justified, despite all the trouble? Nice to read your article! I am looking forward to sharing your adventures funny joke and experiences.